Are you left completely gobsmacked when your car doesn’t start? Do your car headlights and brake lights blink or flicker during driving? Do you spend minutes trying to start your car, but the ignition system just gives you that horrible sound, every single time? What do you do about all of these problems? If you want an end to this continuous torture then come to Pitstop Auto Electrical for all kinds of auto electrical works in Melbourne. With increasing tech advancement, most car service providers, including electricians and mechanics, fail to provide a suitable service, especially for the more modern cars of this century. 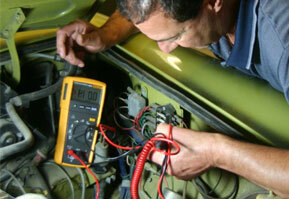 We provide our auto electrician service in Tullamarine, Epping, Reservoir and Broadmeadows. Operating with the latest technology, equipment and machinery, we guarantee that your car gives you un-interrupted satisfaction, relieving you of all troubles. A specialist in everything auto electrical, Laverton and Thomastown residents can really rely on Pitstop. Often it happens that you are out on a family trip, and suddenly your car turns against you, indicating a problem to you through the dashboard and eventually shutting down. You might have absolutely no clue what to do, or whether the problem is in your car fuel injector, starter motor, radiator fan or sparked wires. With inexperienced drivers, it’s a completely different story, and doing something yourself might often make it worse. Therefore, if you are in Reservoir, Tullamarine or Epping, our auto electrician will be at your service, just a ring away. Make sure that you always switch off all your headlights, brake lights, indicators and other in-car auxiliaries, but remember to keep your car theft alarm on. Especially before holidays, check all transmission systems, automatic windows, lights, door locks etc. Pitstop Auto Electrical provides our customers with several high-quality electric supplies and auto electricians to deliver an impeccable service. When it comes to car trouble, call Pitstop Auto Electrical. Laverton, Thomastown and many surround suburbs regularly rely on us when they’re in a pinch, and need their car road-worthy and safe as soon as possible. At Pitstop Auto Electrical, we make sure that our customers leave completely satisfied, because we’re a business that focuses on building solid relationships.